Here are the best San Diego hotels near the beach when you visit this incredibly interesting area. Many of the hotels are within a 10-minute drive to such attractions as SeaWorld, the San Diego Zoo and historic Belmont Amusement Park. Boutique hotels in the area include the trendy Tower23 Hotel as well as the Pantai Inn. When you are looking for onsite resort-style amenities and a family-friendly atmosphere then the Hilton San Diego Resort & Spa, Paradise Point Resort and Spa as well as the Bahia Resort Hotel are ideal. If you like stellar architecture and history then La Valencia Hotel is perfect and the Pacific Terrace Hotel boasts wonderful cliff side views of the Pacific Ocean. When you are searching for basic accommodations right one the beach then the Blue Sea Beach Hotel, Ocean Beach Hotel and the Ocean Park Inn are superb. When you are seeking a lively atmosphere in a San Diego hotel near the beach that is beachfront and close to many of the stellar attractions within the area, then the Blue Sea Beach Hotel is a superb choice. Located on the southern end of Pacific Beach just minutes from SeaWorld, the Blue Sea Beach Hotel is situated directly on Pacific Beach and is within an easy 15-minute drive to the San Diego Zoo. The Blue Sea Beach Hotel has a modern three story architectural style with 126 rooms as well as suites that were renovated in 2016 and feature a contemporary decor. Rooms range in size from 215 to 272 square feet with a choice of bedding and private balcony which sports a view of the pool, partial-ocean or full oceanfront. One-bedroom oceanfront king suites are spacious with a separate living room, microwave and refrigerator (small kitchenette) and private balcony with oceanfront views. The one-bedroom ocean view poolside cabana suite has a separate living room and a poolside patio with views of the ocean. The Blue Sea Beach Hotel has a perfect spot on Pacific Beach where you will find plenty of sand to relax and the water is ideal for swimming as well as onsite surf lessons from the Pacific Surf School. You can walk to Crystal Pier and you are 10-miuntes to Balboa Park as well as the USS Midway Museum. The Blue Sea Beach Hotel has a newly renovated freshwater swimming pool with a great sundeck that overlooks the beach area. There is not a fitness center or restaurant onsite. Offsite dining selections at this San Diego Hotel near the Beach are plentiful in the area within walking distance that includes Fat Fish Cantina Grill, the Baja Beach Cafe and the Mission Restaurant. Nightlife nearby includes the Tavern at the Beach, Dizzy’s for live jazz and Amplified Ale Works. When you are looking for a family-friendly San Diego hotel near the beach that offers a resort-style atmosphere with plenty of onsite amenities then the Bahia Resort Hotel is a perfect selection. Located on the southwestern coastline of Mission Bay, the Bahia Resort Hotel is situated on a 14-acre peninsula which boasts a sandy beach and is less than a 10-minute walk to the historic Belmont Amusement Park. The Bahia Resort Hotel has a Spanish colonial architectural design with 314 rooms and suites that feature a contemporary decor. The Bay Front room is the smallest at 288 square feet with a choice of bedding and private patio with views of the bay front. Garden and Bay view rooms have 318 square feet with a choice of bedding and private patio/balcony. Courtside Garden rooms have 340 square feet with a choice of bedding and private patio with views of the garden. Studios are sized at 480 square feet with an integrated sleeping/living area with sofa and a private balcony with garden or bay views. One-bedroom suites range in size from 450 to 690 square feet with varying floorplans that include a separate living room, small kitchenette (Marina suite has a full kitchen) and a private balcony with views of the marina, garden, bay or bay front. Deluxe suites are sized from 550 to 577 square feet with a separate living room, full kitchen and private balcony with bay or bay front views. 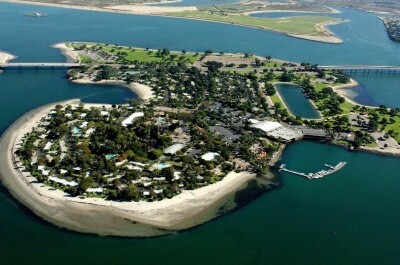 The Bahia Resort Hotel has a nice stretch of beach along Mission Bay for lounging as well as swimming and there is a marina onsite complete with a restored steamer cruise ship to help with all of your watersport adventures. If you are looking for a Pacific Ocean beach then you can take a 5-minute walk to Mission Beach. The Bahia Resort Hotel has a nice location for your explorations with SeaWorld, the San Diego Zoo and Balboa Park all within a very easy drive. The Bahia Resort Hotel also offers complimentary boat rides on the Bahia Belle Mission Bay Cruise. The hotel has a resort type atmosphere during the day with activities for both children and adults. The Bahia Resort Hotel has a freshwater swimming pool with a sundeck that overlooks Mission Bay as well as poolside service. The resort has a fitness center, marina, children’s club, arcade room, tennis courts and you have access to a full service spa offsite. Dining at the Bahia Resort Hotel includes Cafe Bahia serves all three meals and offsite choices within walking distance include the Sandbar Grill, Draft has pub fare and the Mission Restaurant. Nightlife is plentiful at the this marvelous San Diego Hotel near the beach with live music at Tangier Lounge or you can choose something within walking distance like the Coaster Saloon. When you are searching for an upper-mid-range San Diego hotel near the beach that is perfect for all types of travelers with great access to many of the outstanding attractions then you should try the Pacific Terrace Hotel. 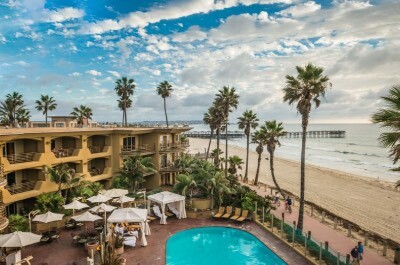 Located on the northern end of Pacific Beach, the Pacific Terrace Hotel is situated on a sandy bluff along the coastline overlooking the Pacific Ocean. The Pacific Terrace Hotel has a modern three story architectural style with 73 rooms and suites that boast a Tommy Bahama decor. Standard rooms have varying floorplans and are sized at 410 square feet with a two queen beds as well as a private balcony that offers a city, partial-ocean or oceanfront view. The Pacific Sunset suite has 590 square feet with an integrated sleeping/living area with sofa, a microwave and refrigerator (small kitchenette) as well as a private balcony that boasts views of the pool and ocean. Junior suites have varying floorplans with 620 square feet that features an integrated sleeping/living area with sofa, small kitchenette, breakfast bar and private balcony which has a pool or ocean view. Family suites have 550 square feet with a separate living room, small kitchenette, dining area and private balcony with pool or partial-ocean views. The Coastal Living Suite features 750 square feet with an open floorplan that contains a small kitchenette, living/dining area and a private balcony that sports views of the coastline. The Pacific Terrace Hotel is just steps from Pacific Beach where you will find plenty of space to relax, play beach games as well as swim and the hotel provides some complimentary beach items on a first come first serve basis. The Pacific Terrace Hotel has a great spot to explore the surrounding area from with attractions such as the Tourmaline Surfing Park, SeaWorld and Belmont Amusement Park within 3-miles from the hotel. The Pacific Terrace Hotel has a freshwater swimming pool with a beautiful sundeck that overlooks the Pacific Ocean and there is a fitness center onsite. Dining consists of a breakfast buffet (additional charge) but there is no restaurant. Offsite dining choices are numerous in the Pacific Beach area with Kona’s Cafe, Enoteca Adriano prepares Italian and World Famous serves seafood. 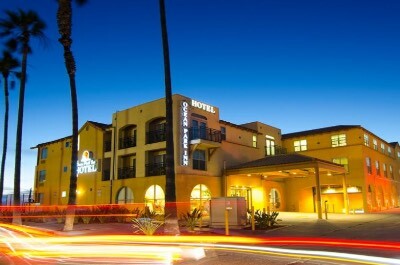 Nightlife within walking distance from this San Diego Hotel near the beach includes Barrel Republic, the Pacific Beach Bar and Grill as well as the Bare Back Grill Pacific Beach. When you are seeking a trendy upscale boutique San Diego hotel near the beach that attracts a younger adult crowd then the Tower23 Hotel is an ideal selection. Located in the Pacific Beach area just north of Mission Bay, theTower23 Hotel is situated steps away from the sand at Pacific Beach and boasts great access to the surrounding activities. The Tower23 Hotel has a modern three story architectural design with 44 pads and suites that sport a chic contemporary decor. There are three styles of pads that feature a choice of bedding and a private balcony with a view of terrace, partial-ocean and beachfront. Studio-style suites are more spacious with an integrated living area, a choice of bedding and a private balcony that boasts a partial-ocean as well as terrace view. The Sweet suite in one-bedroom with a separate living room, 2-bathrooms and two balconies which sport beachfront views. The Tower23 Hotel is steps away from Pacific Beach where you will find plenty of room to lounge, swim and the surfing is great. The Tower23 Hotel offers complimentary bicycles if you choose to explore the boardwalk or Pacific Beach neighborhood. Other attractions within walking distance include Mission Beach, Quicksand Escape Games and the Mission Bay Sport Center is less than one mile away. There is not a freshwater swimming pool or fitness center onsite and spa services are available. 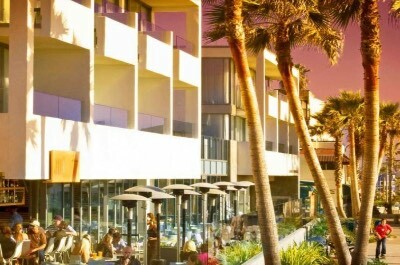 Dining at this San Diego Hotel near the beach includes the chic JRDN Surf:Sky:Spirit: Restaurant which serves all three meals and is a hotspot in the evening for food, fun and drinks. Nightlife is plentiful in the Pacific Beach area where you will find Lahaina, Cass Street Bar and Grill as well as PB Ale House within walking distance. When you are looking for a family-friendly upscale San Diego hotel near the beach that boasts plenty of onsite amenities and is close to several outstanding attractions, then you should stay at the Hilton San Diego Resort and Spa. 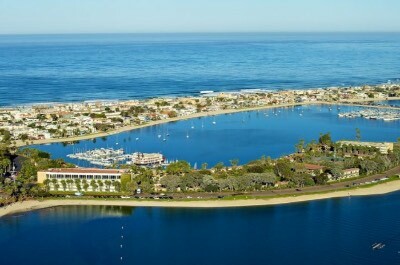 Located on eastern shoreline of Mission Bay just one mile from SeaWorld, the Hilton San Diego Resort and Spa is situated on an 18-acre park with gardens, a manicured lawn and is only steps from the beach. The Hilton San Diego Resort and Spa is composed of a Spanish Mission architectural style as well as a modern eight story tower with 357 rooms and suites that feature a contemporary decor. Standard rooms are available in the tower as well as in villas throughout the resort with 365 square feet that features a choice of bedding and a private balcony that offers views of the gardens, resort or Mission Bay. Studios are sized at 480 square feet with a choice of bedding, an integrated sitting area, microwave and refrigerator (small kitchenette) as well as a private balcony that boasts views of the gardens, partial-bay or waterfront. 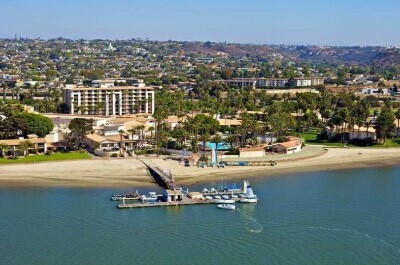 The Hilton San Diego Resort and Spa has a nice beach area along Mission Bay where you can relax as well as go swimming and there is a full service marina onsite to help arrange other fantastic watersport adventures. The Hilton San Diego Resort and Spa has a central location that allows for an easy 10-minute drive to many attractions such as Old Town San Diego State Historic Park, historic Belmont Amusement Park and the hotel offers a free shuttle to SeaWorld. The Hilton San Diego Resort and Spa features scheduled activities within children’s club for an additional charge as well as an assortment of family-friendly games such as bocce ball. The hotel has a freshwater swimming pool with a nice sundeck that has views of Mission Bay as well as poolside service from Fresco’s and there is a children’s pool. Other amenities at this San Diego Hotel near the beach include a fitness center, tennis court, marina, shopping boutique and a full service spa. Dining onsite includes the Acqua California Bistro for all three meals and Fresco’s serves poolside during the day. Offsite dining will require a short walk where you will find the Bay Park Fish Company, Baci Ristorante Italiano and Andre’s Cuban Restaurant. Nightlife includes fire pits on the beach and dive-in movies or you can take a short walk to the Silver Spigot Cocktail Lounge. When you are searching for a mid-range family-friendly San Diego hotel near the beach that is close to several attractions then the Ocean Park Inn is a great choice. 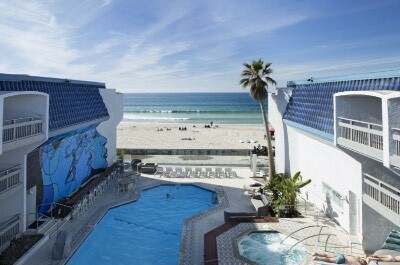 Located in Pacific Beach just minutes away from SeaWorld, the Ocean Park Inn is situated directly on the boardwalk overlooking the Pacific Ocean. The Ocean Park Inn has a modern three story architectural style with 72 rooms and suites that boast a contemporary decor. King bed rooms are sized from 300 to 320 square feet with a refrigerator and microwave (small kitchenette) and private balcony that offers views of the pool of ocean. Two queen bed rooms have between 395 and 415 square feet with a small kitchenette as well as private balcony with pool or ocean views. Junior suites are sized at 520 square feet with an integrated sleeping/living area with sofa, a small kitchenette and private balcony with pool or ocean views. One-bedroom suites range in size from 650 to 675 square feet with a choice of bedding, a separate living room, large kitchenette (2-burner stove) and a private balcony with views of the ocean. 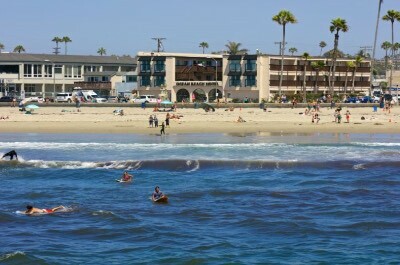 The Ocean Park Inn is just steps away from Pacific Beach where you can lounge, play beach games or go swimming. The property is perfect for exploring San Diego with the historic Belmont Amusement Park, SeaWorld and Mount Soledad as well as the Escape Room Games all within a 10-minute drive. The Ocean Park Inn has a nice freshwater swimming pool with sundeck that looks out over the Pacific Ocean. There is not a fitness center or restaurant onsite. You can indulge in a complimentary continental breakfast daily and there are a plethora of dining options within walking distance that include Kono’s Cafe for diner food, the Fat Fish Cantina Grill serves Mexican and World Famous prepares seafood. Nightlife is plentiful near this San Diego Hotel near the beach in the Pacific Beach area with Lahaina for cold beverages and the Tavern at the Beach for live music. When are looking for a family-friendly upscale San Diego hotel near the beach with onsite resort style amenities then the Paradise Point Resort and Spa is a superb selection. Located on a private island within Mission Bay just minutes from SeaWorld, the Paradise Point Resort and Spa is situated on 44-acres of Balinese style landscape which is complete with lagoons and boasts a one mile stretch of beach directly on shoreline of Mission Bay. The Paradise Point Resort and Spa has a Balinese architectural style with 462 bungalows, rooms and suites that sport a refreshing Balinese decor. Standard guest rooms have 450 square feet with a private patio and have a resort view. Lanai rooms are 460 square feet with a choice of bedding and private patio with garden or Mission Bay views. Junior suites range in size from 460 to 550 square feet with an integrated living/sleeping area (some with fireplaces) and a private patio that sports a view of the bay front or gardens. One-bedroom bungalows have 650 square feet with a separate living room and a private patio that features bay front or garden views. One-bedroom executive suites are spacious with a separate living room, dining area, wet bar and private patio with a garden view. There are two Presidential suites that range in size from 1,600 to 3,250 square feet with one-bedroom, 1.5-bathrooms, a full kitchen and expansive outdoor living space with a fireplace as well as bay views. The Paradise Point Resort and Spa has a perfect one mile stretch of beach where you can lounge as well as swim and there is a full service marina which offers many watersport adventures. The Paradise Point Resort and Spa is within 15-minutes to many stellar attractions such as the Sand Diego Zoo, Balboa Park and SeaWorld. The Paradise Point Resort and Spa is loaded with onsite amenities like a children’s club to keep your child busy with organized activities and there is a kid’s pool. The resort has five freshwater swimming pools with perfect landscaped sundecks and there is an adults-only pool. The Paradise Point Resort and Spa has a putting green, kid’s club, marina, fitness center and full service spa onsite. Dining includes four restaurants which are the Barefoot Bar and Grill for all three meals; Tropics Cantina prepares fresh Mex as well as Caveman Pizza has Italian for lunch and early dinner and Tidal is open for dinner serving eclectic cuisine. Offsite dining will require a short drive to the Mission Restaurant, Oceana Coastal Kitchen prepares Japanese and La Playa Taco Stop serve Mexican dishes. Nightlife at this San Diego Hotel near the beach includes watching the sunset at the Barfoot Bar and Grill or venturing off-property to the Pacific Beach AleHouse for a pub style atmosphere. When you are seeking for an upper-mid-range boutique San Diego hotel near the beach that boasts a Balinese type atmosphere then the Pantai Inn is a perfect choice. 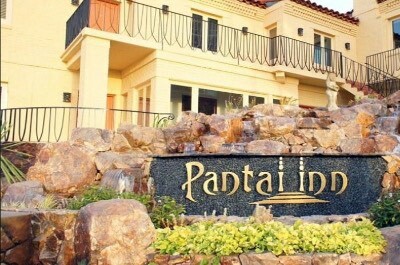 Located in the La Jolla Cove area, the Pantai Inn is situated within lush gardens that boast fountains and is just steps away from La Jolla Cove Beach as well as the Shell Beach Tide Pools. The Pantai Inn has a Mediterranean design with 30 suites and cottages which sport a Balinese decor. Studios are spacious in size with an integrated living/sleeping area and feature a semi-private balcony with views of the ocean. One-bedroom suites have a separate living room with fireplace, a separate dining area, a full kitchen and garden, partial-ocean and ocean views (only ocean view and ocean view premium units have balconies). Two-bedroom suites have multi-levels with separate living and dining rooms, fireplace, a full kitchen and views of the ocean from large picture windows. Three-bedroom suites have separate living and dining rooms, fireplace, a full kitchen, 2-bathrooms and a partial-ocean view from picture windows. One-bedroom cottages are spacious with a separate living room, a full kitchen and garden, partial-ocean or full ocean views (classic cottages do not have a balcony). Two-bedroom cottages feature a separate living room, a full kitchen and views of the city or partial-ocean from picture windows. The Pantai Inn has a great spot and is only minutes from La Jolla Cove Beach where you will find perfect sand for relaxing as well as good swimming conditions. Other exciting attractions within a short walking distance include the La Jolla Caves, the Museum of Contemporary Art San Diego and Torrey Pines State Natural Reserve. The Pantai Inn has a gorgeous landscaped garden with exotic plants and outdoor fire pits but there is not a freshwater swimming pool or fitness center onsite. You will enjoy a complimentary breakfast daily but there is no restaurant and dining options within a short walk include Eddie V’s Prime Seafood, the Spot prepares barbeque and Puesto Mexican Street Food. Nightlife offsite within walking distance fro this San Diego Hotel near the beach includes the Hard Rock Cafe, the Karl Strauss Brewing Company for craft beers and the Public House La Jolla boasts a pub atmosphere. When you are searching for an upscale romantic historic San Diego hotel near the beach that offers luxury amenities then the La Valencia Hotel is the perfect selection. 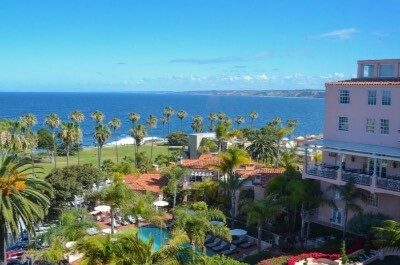 Located in downtown La Jolla within a 5-minute walk of La Jolla Cove Beach, the La Valencia Hotel also known as the “Pink Lady’ has a lush garden landscape overlooking the Pacific Ocean. The La Valencia Hotel was constructed in 1909 and is on the National Register of Historic Places. The La Valencia Hotel features a complex of several Mediterranean style buildings which contain 114 rooms as well as villas which were renovated in 2014 with a contemporary decor. Vintage rooms have 250 square feet with a choice of garden or partial-ocean view. Classic rooms range in size from 400 to 425 square feet with a choice of bedding and views of the gardens or ocean. Classic junior suites have 450 square feet that has an integrated living/sleeping area with a sofa and views of the gardens, city or ocean. One-bedroom classic king suites have a separate living room and boast views of the ocean from picture windows. Villa king rooms have 425 square feet with views of the garden or ocean from large windows. One-bedroom villa king suites are sized at 800 square feet with a separate living room and a private balcony that offers views of the gardens or ocean. The one-bedroom ICON Sky suite features an open living room with a dining area and sports 180 degree views of the ocean from retractable windows as well as a Juliet balcony in the bedroom. The ICON Pacific suite features one-bedroom, a separate living room with huge bay windows that boast views of the ocean. The one-bedroom ICON La Valencia suite has 1,000 square feet with a separate living room, a kitchenette and a 250 square feet wraparound balcony with views of the Pacific Ocean. The La Valencia is ideally situated just minutes from La Jolla Cove where you will find plenty of sand to lounge and the water is perfect for swimming as well as surfing farther offshore. The La Valencia boasts easy access to several attractions such as Ellen Browning Scripps Park, the Shell Beach Tide Pools as well as the Map and Atlas Museum of La Jolla are all within a few blocks of the property. The La Valencia Hotel offers a stunning freshwater swimming pool with a sundeck that overlooks the Pacific Ocean, a fitness center and spa services onsite. Dining at this San Diego Hotel near the beach includes all three meals at the MED and lunch as well as dinner is served at Cafe la Rue. Offsite dining choices within an easy walk include Cody’s for seafood dishes, Duke’s La Jolla prepares Hawaiian and George’s at the Cove serves contemporary cuisine. Nightlife onsite includes live music at La Sala Lounge or you can venture offsite to the Whaling Bar or the Hard Rock Cafe. When you are searching for a San Diego hotel near the beach that is steps away from many activities then the Ocean Beach Hotel is an ideal choice. Located in the Ocean Beach area just 5-minutes from SeaWorld, Ocean Beach Hotel is situated directly across the street from the beach and Ocean Beach Municipal Pier. The Ocean Beach Hotel has a modern three story architectural design with 58 rooms that feature a contemporary décor. Partial Ocean view and Courtside rooms are the smallest with choice of bedding and no balcony. Private Patio rooms are larger with a choice of bedding and a private patio. Ocean view with balcony rooms are similar in size with a choice of bedding and private balcony that sports an ocean view. Oceanfront Private King suites are large with one king size bed, sofa, floor to ceiling windows that boast great views of the oceanfront. Oceanfront King suites with balcony have two beds and a private balcony that has stunning views of the oceanfront. The Ocean Beach Hotel has a perfect spot steps away from an active beach which is great for lounging, swimming and surfers can take advantage of the waves. The Ocean Beach Hotel offers easy access to several major attractions like Sunset Cliffs Natural Park, historic Belmont Park as well as the Mission Bay Aquatic Center are all within a 2-miles of the hotel and the San Diego Zoo 15-minutes away. The Ocean Beach Hotel does not offer a fitness center, freshwater swimming pool or restaurant onsite. Dining options within an easy walking distance are Hodad’s for American, Nico’s Mexican Food as well as the 3rd Corner serves French. Nightlife is plentiful within walking distance from this San Diego Hotel near the beach with venues like Winston’s Beach Club for live music as well as the Barefoot Bar and Grill or checkout a concert at Humphrey’s Concerts by the Bay.